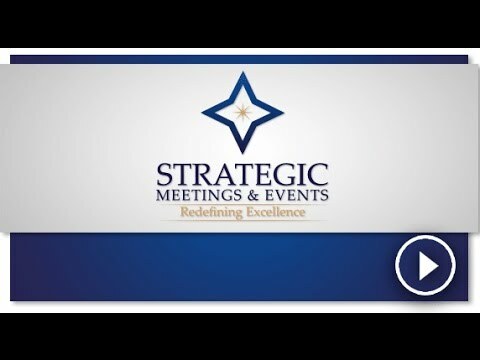 Strategic Meetings & Events is a certified and globally recognized Meeting, Conference and Event Management Company with remarkable experience in our field. Our Strategic Meeting Management Service, simply stated, means we will engage with all levels of your organization, from executive management to staff, in order to identify your high-level objectives, align them with your employee and customer needs and create a strategic plan to achieve them. Our professionalism and credibility are proven by our staff who hold the highest* global certifications in meeting and event management; CMP-Certified Meeting Professional and CMM-Certification in Meeting Management, a global designation for senior-level meeting professionals. Whereas the CMP is focused on tactical/logistical planning, the CMM is focused on strategic issues that are critical to advancements in the meetings industry, such as ROI and executive decision-making. *Global Certification in Meeting Management is designed for meeting planners and suppliers with ten or more years of experience who want to be recognized as a strategic contributor to the bottom-line of his/her organization.